Holiday Cranberry Fruit Salad topped with fresh cranberries and a delicious vanilla yogurt whipped cream. A delicious, beautiful, festive side dish for the holidays. It’s beautifully festive. Fresh cranberries do that to a dish, don’t you think? Anyone can make it. It’s incredibly simple, and you really can’t mess this up. This is one of those easy side dishes my mom would have assigned me to make when I was really young and eager to help in the kitchen. Everyone will enjoy it. If you’re feeding this to a group of family or friends you are sure to please every age group you’re serving. The fresh fruit, sweetened cranberries and vanilla yogurt topping go together perfectly. It’s no bake, so you don’t have to worry about hogging precious oven space if you’re making it as part of a holiday meal. It’s really easy to prepare in advance. I don’t suggest putting it all together in advance, because juice from the fruit will pile at the bottom of the bowl. The best way to prepare it in advance is to have all of your fruit cut and stored separately. (Be sure to toss the apples really well in lemon juice so that they don’t brown). My family really enjoys this dish, and I love how simple and festive it is. The fresh cranberries add the perfect pop of flavor. Be sure to leave time for them to rest with the sugar, the night before you prepare this recipe. That way they will soak up all of that sweet flavor, and you can drain the juice so that they it does not dye your fruit red. If you like this idea, you should also try my Cranberry fluff, Apple Cranberry Salad, or this holiday jello fruit salad. Don’t forget to FOLLOW ME on FACEBOOK, TWITTER, INSTAGRAM and PINTEREST for more great recipes! Layered fruit salad, topped with fresh cranberries and an amazing vanilla yogurt whipped cream makes a delicious, festive side dish for the holidays. Rinse cranberries and place in a food processor fitted with a metal blade. Pulse a few times until coarsley chopped. Transfer cranberries to a large tupperware. Add sugar and stir to combine. Cover container and refrigerate overnight (or at least for 6-8 hours). Pour cranberries in a strainer and allow them to drain for 1 hour (discard leftover liquid). Add heavy cream to a mixing bowl and beat with electric mixers. Slowly add powdered sugar and continue to mix until very stiff peaks form. Fold in the vanilla Greek yogurt. Chop the apples into bite-size pieces and toss them in a little bit of lemon juice. 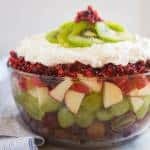 In a large glass serving bowl or a trifle dish, layer the red grapes, followed by green grapes, and then apples. 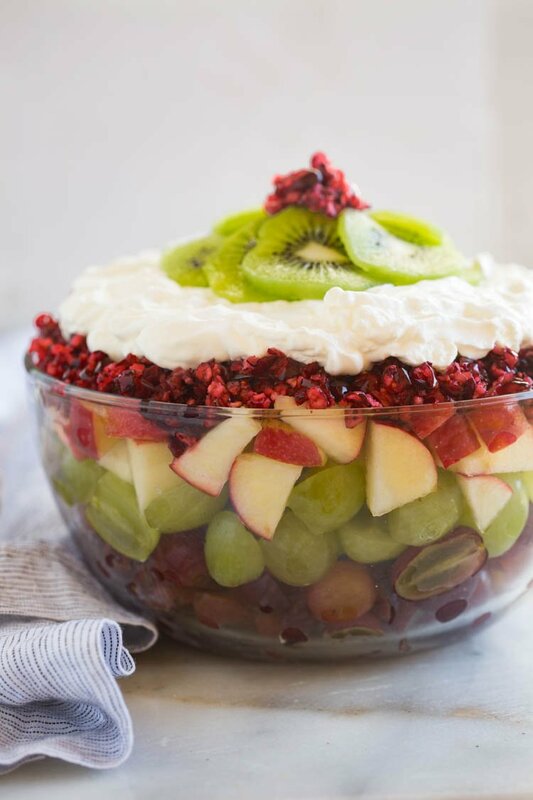 Layer the chopped cranberries over the top (I like to reserve 1 spoonful for topping on the kiwis at the end. Spoon the whipped cream/yogurt mixture on top of the cranberries. Arrange the kiwis on top of the whipped cream. Place remaining spoonful of cranberries in the center. I think this is best served within an hour or two of assembling. Otherwise, liquid from the fruit will pool at the bottom of the bowl. If you'd like to make it in advance, I'd suggest chopping and storing all of the fruit in separate ziplock bags. Make the whipped cream/yogurt mixture and store it separately as well, for up to 1-2 days in advance. Have you tried this recipe?! RATE and COMMENT below! I would love to hear your experience. I made this fruit salad for our Thanksgiving brunch. It was fantastic! It was very easy to make and simple to assemble, although draining the cranberries took the most amount of time. I washed and prepped everything the day before, making sure I drained the cranberries a few hours before assembling the salad. I placed all the washed fruit in baggies so I just poured out each layer when I was ready to assemble. Adding a bit of lemon to the apples is a must. This salad will be added to all of my holiday menus in the future. I bet it would work for potlucks as well! Thank you so much for sharing this recipe. Thank you so much for taking the time to comment! I’m so happy you liked it and I love your input for making it ahead of time. Thanks for sharing! This salad recipe is a KEEPER! Easy and super delicious especially with the fresh fall apples and grapes. Does this get mixed together? Or people just mix their own after dishing..? Made this for a group of 20 women. It was the hit of the evenining and had a request to make it for another event. Will be using this recipe a lot. It is delicious! Tried this for a December meeting of my women’s group & potluck and it was a big hit! Everyone commented on how beautiful it was and tasty. Several requests for recipe. I too did a lot of the prep the day before so it was a matter of assembling a couple of hours before our meeting. I’d never worked with fresh cranberries before or fresh whipped cream—both was easy Peary!! My FREE tools & favorite tricks to avoid dinner-time stress!